In 2014, after 150 years of continuous existence, the Lucerne Jewish community hardly exists. The decline of the Jewish community in Lucerne is mirrored in many places throughout Switzerland. There are fewer than 18,000 Jews in Switzerland, while the number of Swiss Jews in Israel is estimated at some 14,000, with many younger and more committed Jews relocating there. 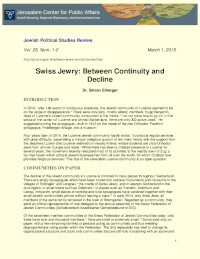 The Swiss Jewish community is shrinking at an alarming rate and has far less influence than in previous years.